As the malicious jinsuls continue their conquest of the Scoured Stars system after chasing out the Starfinder Society, the Society's leaders have banded together to learn more of their new rivals. Before attacking the Scoured Stars, the jinsuls had adopted a new homeworld out in the Vast. The PCs join an expedition to this largely abandoned and hazardous planet in hopes of uncovering the origins of the jinsul menace. 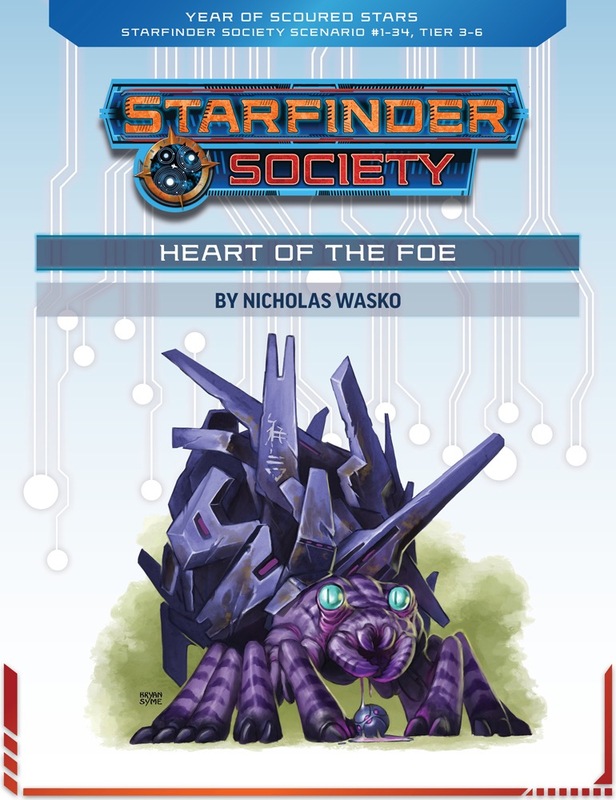 Content in Heart of the Foe follows-up on the events of Starfinder Society #1-99: The Scoured Stars Invasion, though playing the previous scenario is not required. Content in this scenario also contributes to the ongoing goals of the Second Seekers (Jadnura) faction, Second Seeker (Luwazi Elsebo) faction and to the ongoing year of the Scoured Stars storyline. This review is primarily intended to provide feedback to the Organized Play team (as they have requested) and for GMs. While I’ve tried to keep this review relatively spoiler free, I recommend that players who are interested in playing this scenario move to the next review. There is a lot to like in Heart of the Foe. As Meloriel posted, this is a complex scenario and should not be attempted by inexperienced GMs or someone who has not had time to prepare. Conversely, this is the type of scenario I would love to run at a convention so that I can better internalize what needs to be managed from session to session. There is a lot going on and the GM needs to have a solid understanding of the entire scenario and how pieces interact to run it well. I’m giving a 4-star review because the scenario has many excellent qualities to it, but is brought down by omissions of required details and inflicting arbitrary rules on the players. I applaud the idea of having some sort of negative repercussions to keeping environmental systems sealed. I really wish the CRB had addressed this in some way instead of leaving it to scenario writers. However, this attempt falls flat. It doesn’t make sense that snow buildup would affect someone’s helmet but not affect their face. How difficult should it really be to clear the snow off of a helmet compared to one’s face? The travel section is interesting and has a lot going on. But this section would go completely differently if a PC brings a vehicle. The vehicle should take damage from the crash landing, but it should be functional (unless very low level or unlucky). While a GM could disallow a PC from bringing a vehicle on the shuttle, this could unfairly penalize a character who has heavily invested in a vehicle (like one of my local players who dropped 32,000 credits on a vehicle and was still wearing Second Skin armor at 8th level - that character did not play this scenario). I got into a good rhythm working through the storm hazards and investigation along the trip. Rather than give the PCs the clues as they went along, I recorded successes and failures and gave them the results shortly before entering the city. However, I didn’t correctly note that encounter A takes place in the middle of the trip. In terms of layout, the Development section would be better if it is in front of the Creatures section. Doing so would have been very helpful in making sure that I called out the observer during the combat. It would have also been helpful if that section was in its own paragraph (to help draw the GMs attention). The scenario states that the PCs cannot rest if they have taken any nonlethal cold damage. How does this make sense? It does make sense that environmental seals be up such that the PC is no longer exposed to the cold condition. Requiring 20 minutes for a rest instead of 10 minutes just seems odd since the only restriction in the CRB is uninterrupted rest. Encounter B has another odd map choice. Since this encounter is in a city, I would have chosen something like City Streets or Slum Quarter. The current map doesn’t really make it feel like the group is in a city. I also think that starting the chase with the PCs in the middle of a city map would feel more natural (though it certainly worked as written). I wasn’t sure where to run the encounter and put the PCs on the south side. The start of the combat is interesting, but I wasn’t quite sure how to initiate it. I had the enemy crash the vehicle (and exit the vehicle) at the start of the surprise round and then had PCs acting in the surprise round go next. One possibility is for the vehicle to come around the corner just before the start of the surprise round, then the PCs (who can act in the surprise round) would have an opportunity to shoot the vehicle (possibly disabling it) or at the enemy before the vehicle attempts to ram someone. The action really picks up with the chase scene. I like the idea of using the Vehicle chase rules with some alternative skill choices. It’s also a very nice touch that skill check successes in a previous section matter. Unfortunately, some details to run the chase are missing for the enemy side. The enemy horde isn’t given a vehicle tech level, so there is no DC for horde actions. (I used the party APL to set the DCs.) The PCs have the opportunity to attack the horde, but no EAC/KAC is given. (The scenario author has recommended values in the SFS GM prep thread.) No rules are given for area of effect spells. One of my players wanted to use Hurl Forcedisk, I allowed him to do so. Should the grapple attack roll be against normal KAC or against KAC+8; I recommend normal KAC to give the horde a reasonable chance of grappling and providing more urgency for the PCs to fight off the horde. My PCs had no difficulty in damaging the horde enough to free a grappled PC. They had nearly killed horde after only two rounds. They then escaped as I rolled poorly for the horde attempting to keep up and the party escaped. The final battle ended up being quite exciting. I liked that the fight occurs on a multi-level structure as that makes jump jets and jetpacks useful in the fight. The players were challenged by having the demon at one end and reinforcements coming from the other end. The demon can really be tough with his spell-like abilities. If successful is summoning another one, this fight could turn brutal. The players selected the aid option of having the Starfinders freed and armed. I gave the players control of the freed Starfinders in the battle; GMs might want to print the statblock out for the players. They were quite aggressive with that and one of the Starfinders died. It would have been nice if the Starfinders at least had one RP so that they could stabilize him; then the PCs would have to consider using resources to get him up and moving again. This is a complex battle. I forgot about the traps (described in the text, but not marked on the map). I also forgot about Jadnura’s support until fairly late in the combat (though they didn’t end up needing the help). I look forward to running this scenario again where I expect that I’ll do a better job of presentation. Perspective: GMed this at high tier for a 4-player party. I'm a little less enchanted with the mechanical execution. It requires quite some GM prep to run smoothly and ought to have had the [vehicle] tag just to signify you should have those rules fresh in mind. On high tier I felt the combat was a bit on the easy side, but I suspect it'll be exactly on the sweet spot on low tier. A challenge to run but definitely worth it. This scenario continues the ongoing Scoured Stars storyline and is the first scenario to prominently feature both First Seekers. As such you’ll want to bring along characters who have an interest in the Scoured Stars Trinary System or storyline, who have interacted with the jinsul, or are working on collecting the ‘Journey to Scoured Stars’ boons. I also recommend bringing a character who does not have a Personal Boon permanently slotted. This scenario doesn’t include a vehicle chase (but it could) it does use modified vehicle chase rules, which most players do not have internalized (in my experience). GMs will likely need to brush up on the vehicle chase rules and be prepared to teach it to their players as needed. Be aware that this is a rather dense scenario, so groups that are unfamiliar with chases could cause it to run long. 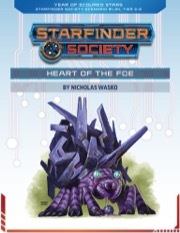 Heart of the Foe begins when both First Seeker Luwazi Elsebo and First Seeker Jadnura task the PCs with travelling to a planet the jinsul are known to occassionally visit in order to discover actionable intel and information about the jinsul themselves. Your PCs will need to travel to the mysterious planet — alongside both First Seekers and three other Starfinder teams — investigate a few sites that show signs of life, and uncover what they can about the jinsul and their society. Neither the Starfinder Society nor the players know a whole lot about these insectile fellows, so I was thrilled to dig a little deeper into the history of the jinsul themselves. Exciting stuff! Throughout the course of this scenario PCs will get to learn about jinsul anatomy, culture, history, religious beliefs, and — oh yeah — fight a whole lot of jinsul! It’s an action packed, dynamic, exciting scenario that’s going to be a lot of fun. The battles all serve a purpose, the chase scene is both exciting and complex, and the world itself is very atmospheric. It's got a very 'Borderlands' feel to it that I really enjoyed. The finale is exciting and challenging, with a lot of moving parts. It’s chaotic and really well done. Dare I say… epic? Heck, yeah, I do! There’s only one real social encounter, but the character you get to interact with is really… unique so it strikes a nice balance. I love their demeanour and attitude towards the PCs. So good! GMs need to be aware that this is a tough scenario to run. This is not the kind of scenario an inexperienced GM should attempt. There’s vehicle chase rules, modifications to the vehicle chase rules, environmental conditions, a whole lot of dice rolling during travel scenes, plenty of hopping around between pages for potential clues and intel, and complex battles with lots of enemies and allies to track. Not easy. It has a bit of a slow start. Not the immediate start, but the… well let’s call it the travel scene. There’s a lot of dice rolling done every hour, which runs the risk of becoming a boring sort of routine if not handled right (particularly when you take into account the flipping between pages that might have to occur). That said, I do like the information your group could uncover about the jinsul along the way. I do have a minor complaint regarding environmental protections in this scenario. Chances are your characters have them. They protect us from a lot, but there’s also things it won’t protect you from. Totally fair. But in this scenario it feels like you get penalized for using them. You either use them and suffer X or don’t use them and suffer Y. Which is unfortunate. The scenario refers to snow clinging to your environmental protections’ helmet — when many armour’s environmental protections use a force field instead of helmets — and even if you are wearing armour that has a helmet, couldn’t you just wipe it off? And if you are wearing armour that has an environmental forcefield for it’s environmental protections, can it seriously not handle a bit of clingy snow? I’m totally cool with some environmental hazards going through your protections, but this snow thing just wasn’t one of them. It felt... arbitrary, I suppose. If they wanted the snow to hamper visibility, I’m totally fine with that. I am no stranger to snow and yeah, it’s hard to see sometimes. But in this instance it felt like players were being unnecessarily punished in an irritating sort of way. So, I love that baby jinsul on the cover! Except it’s not a baby jinsul at all. It’s a jinsul’s pet. I 100% thought it was a baby jinsul and was thrilled by it’s oddly adorable appearance. Jokes on me, I guess. Haha. Seriously though, I really like the creature, it’s stats, and it’s tactics. Overall, I thought this was a really great, dynamic, memorable scenario that’s going to be a challenge to run — but well worth it! Such a blast! Definitely a 5 star scenario!